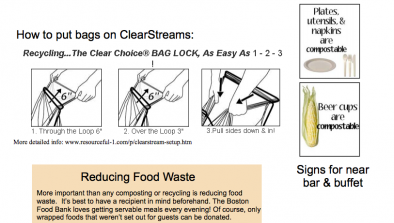 For Earth Week, Gutman Café challenged the HGSE community to cut back on landfill waste with the goal: 1 Week = 1 Bag of Trash. In order to prepare for the Zero Waste Challenge, Gutman Commons Café worked behind the scenes with Café staff to ensure all food items not sold in environmentally-friendly packaging (i.e. candy bars, chips, etc.) were removed from the shelves. Instead, the Café created its own tasty in-house versions of these popular snacks and packaged them exclusively in recyclable or compostable containers. With industrial packaging, latex gloves, and plastic wrap, the typical output in the kitchen would be at least one 60 gallon bag each day. In order to cut down on industrial packaging, the Kitchen Manager, Geovanni, ordered all of its weekly products in bulk and worked with purveyors to ensure that produce would be delivered in recyclable boxes. By recycling and composting all the food, beverages and containers in the Café for one week, Gutman Café Kitchen was successful in fitting all of its garbage into a single 60 gallon bag. (Compare that to the Kitchen’s typical 60 gallon bag a day output.) In fact, the contents of the bag contained mostly kitchen supplies necessary for large scale food preparation such as gloves, plastic wrap, and industrial packaging (e.g. non-recyclable plastic bags). All other kitchen and Café waste was diverted from the landfill. The Zero Waste Challenge was an excellent educational and engagement opportunity—both for HGSE community members but also for Café staff, who proudly donned green chefs’ coats in support of the week-long challenge. As you walked through the Café, there was plenty of signage on display demonstrating the Café’s commitment to sustainability not just for Earth Week but every day. For example, the various food stations highlighted everything from the Café’s proud partnership with its local vendors to “Did you know?” fun fact posters like the true cost of a burger in terms of total water consumption, land use, animal feed and fossil fuel energy. 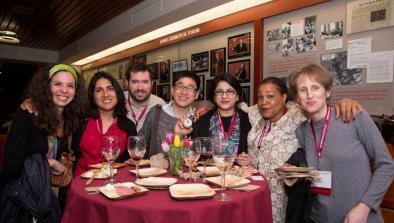 HGSE’s Zero Waste Challenge Week would not have been possible without the hard work and vision of Tables of Content, HGSE’s Café and catering single source provider, overseen by the Event Operations Department.